SKI IN/OUT Chair lift near door. View! Heated Pool, Hot tub. Great for family. Gorgeous condo in the Ski in/Ski Out Borders Lodge - yes, skiing is LITERALLY right out the back door at the Elkhorn lift, and the Centennial Lift is only two minutes away on the complimentary shuttle! This Penthouse Condo boasts a very spacious 2300 square feet of luxury living. The large living area features a cozy fireplace and the best views in Beaver Creek, both from inside and out on the attached balcony. Luxury finishes at every turn including hardwood floors, granite countertops, five flat screen televisions. The kitchen is large and the dining table seats 8 easily. This condo is perfect for family living and cozy apres ski evenings. Relax on the terrace and soak in the absolutely incredible views, perfect for morning coffee and evening drinks. There is a full size washer and dryer which means you can carry less luggage!! And there is a cute powder room just off the foyer next to the kitchen. The upstairs Master Bedroom has a king sized bed, a very large private bathroom with jacuzzi tub, a walk in closet, and steam shower. The Master Bedroom on the main floor has a large flat screen TV and a private balcony with fantastic views of the ski mountain, plus its own bathroom with tub and shower. The 3rd bedroom has twin beds and its own bath with tub and shower. There is a sleeper sofa in the living room. This condo offers the comfort of a private residence with the personal service of a fine hotel. The Borders Lodge offers a front desk, daily housekeeping, private underground parking and is part of the Wyndham Vacation Rentals family. A recent $1.6 million renovation, unveiled for the 2013/2014 ski season, updated the interior common areas with red birch woodwork, custom granite selections, wool carpeting and slate tiling to enhance the look and feel of a sophisticated mountain lodge.Additional resort amenities include an outdoor heated pool, a hot tub, private ski lockers and a group meeting room for up to 50 people. There is a work out room near the large heated outdoor pool and hot tub. Beaver Creek Village is only a five minute walk from The Borders Lodge and is lined with spectacular shopping, gourmet dining, and plenty of entertainment for all ages - including an ice skating rink just waiting for family fun. Just ask the VRBO Bear - this condo is the perfect rental for your Beaver Creek getaway, the only thing missing is you! Call today to book your next vacation! I love to ski and travel. I have 2 grown Austrian sons and 5 wonderful grandchildren. I rent my condo so that I can continue my charity work teaching technical skills to young women in 3rd world countries. Skiing and Golf are my favorite sports. I can walk to both from this location. I love the view of the ski mountain out the large picture windows and The Village is charming both winter and summer. The condo is quiet and very spacious. There is a parking garage and a great staff. I also enjoy the well heated swimming pool and hot tub just steps from the back door. Bring your bathing suit! Beaver Creek is fantastic year round! The friendships are priceless, The Village is friendly for both children and adults and there is something to do for everyone on everyday of the year. Even for grandmothers! We are in the Beaver Creek Village. Avon is 5 minutes down the hill. 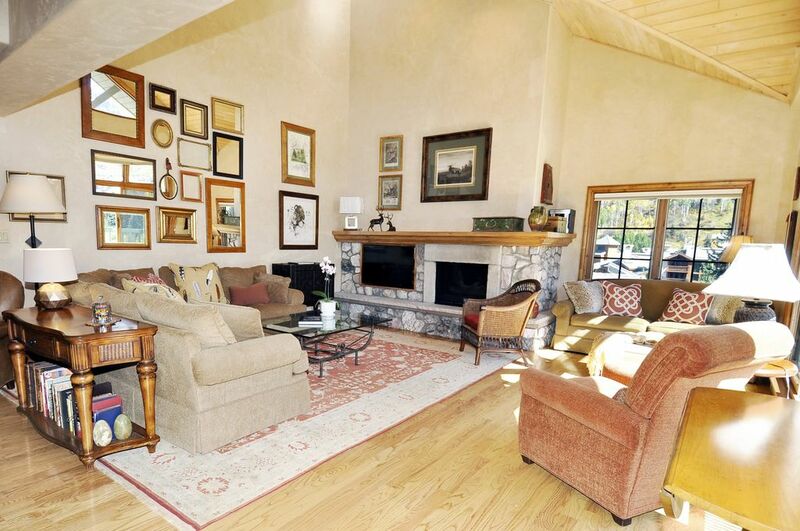 This Penthouse Condo located in Beaver Creek Village. You can walk to the ice rink or enjoy the pool just steps from our door. The Beaver Creek Village has many family oriented activities. Golf course is across the street. Magnificent views of Beaver Creek ski slopes. You can watch your family ski down the mountain. There is a ski lift out the back door of the building, just 10 steps from your ski locker. Ski lift just steps out the back door. TRUE ski in, ski out This property has ski lockers just inside the door which is steps from Elk Horn lift. Lovely dining area with 8 chairs and incredible view of the ski mountain and village lights. You will believe that the fire works each week are just for you and your family. 2 Balconies. One off of living room and a second one off the Master Bedroom on the main floor. Full ski slope views. Magnificent on a sunny day for sun bathing. Easily accessible with Wheel Chair or for someone who does not like stairs. Main level master bedroom and bath can be accessed without stairs from entrance of building or from garage. Wonderful heated pool and hot tub steps from building. Large well heated swimming pool just steps from the door. Heated walkway around pool. Ski Lift Only Steps From The Door! Our family of 5 thoroughly enjoyed staying in this cozy penthouse condo with an amazing mountain view. Easy ski in/ski out access. Nice garage for parking. Heated hot tub. The owner was accommodating and very nice to work with. Beautiful, bright and spacious condo, with great mountain views. A perfect location for a family ski vacation. Plenty of room for everyone. Large bedrooms plus a great open living area. Beaver Creek for the holidays can’t be beat. You can walk to the village or take the free shuttle. Outstanding ski in/out access (no catwalks, distance to the lift measured in ft). The condo (Penthouse) is in Beaver Creek Village. This is a very cozy, upscale Ski In/Out Penthouse with a large heated pool and hot tub just steps from the door. Perfect for a family vacation! There is an adequate work out room for every level of athlete just off the lobby. Full payment for high season, Christmas bookings please pay 60 days in advance. This is because renters need to book airfare. After mid December, payment is requested immediately to secure dates. Thank you for understanding.